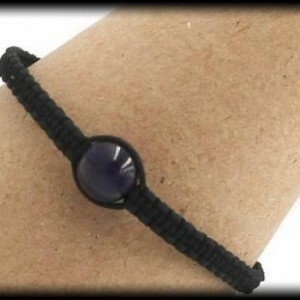 Invigorate your chakra with this Amazing Amethyst based stretch bracelet! Amethyst is an extremely powerful and protective stone which facilitates decision-making, protects against reoccurring nightmares, enhances memory, and improves motivation. It is a highly prized stone well known for its unique purple coloration and works in the spiritual, physical, and emotional sense to promote peace, calm, and balance. 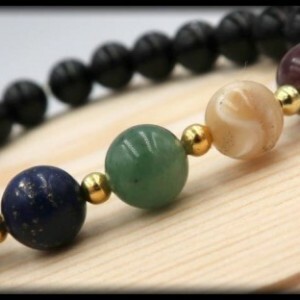 This popular stone has been incorporated as the beaded base of this chakra bracelet for its many other positive attributes and benefits. This item contains 8mm beads of Amethyst, Clear Quartz, Black Obsidian, Lapis Lazuli, Green Aventurine, Mother of Pearl, Pink Tourmaline, and Hematite. SIZING INFORMATION Please measure your wrist with a measuring tape to ensure the most accurate measurement. If you do not have a measuring tape, you can also use a string by wrapping it around your wrist and then cutting the piece of string. After you have your cut string, place it alongside a ruler and write down your measurement. To ensure a perfect fit, please had 0.5 inch to your wrist measurement, if you want a little room please add .75 inches to your wrist measurement.